One of the craziest things for me to think about is how far couples often come to be together for an adventure elopement. Usually, they are traveling together and adventure out to a destination, but for Ailsa and Austin, they were putting more miles in than most. What is perhaps most unique about them is how distance is nothing new to them. Ailsa and Austin's story is your typical "Scottish girl meets Southern California boy in Florida" romance. But for real, this couple's story is anything but typical which is what makes it so delightful. Due to grad school, they've had 5,000 miles between them for quite a while, building their relationship through trips to different countries and catching planes to ride out hurricanes together while studying. In her first emails, Ailsa explained she was finishing her masters in Sweden while Austin was finishing his program in Florida. At the time, Callen and I were on the road shooting elopements in Moab and Yosemite. From Sweden to Florida is around 4,906 miles and from Florida to California is another 2,697. At over 7,500 miles, this is probably the greatest distance we've ever had between any of our couples. Ailsa reached out a full year before their elopement, and it became clear from early on that we had a huge connection with this couple. So, after a year of planning, meeting up in Yosemite made it feel like we were about to go hang out with old friends. Honestly, that's what it felt like when we finally met (and why we're planning to hang out with them when after we head back to Texas - it's honestly so special how many couples end up being lifelong friends). 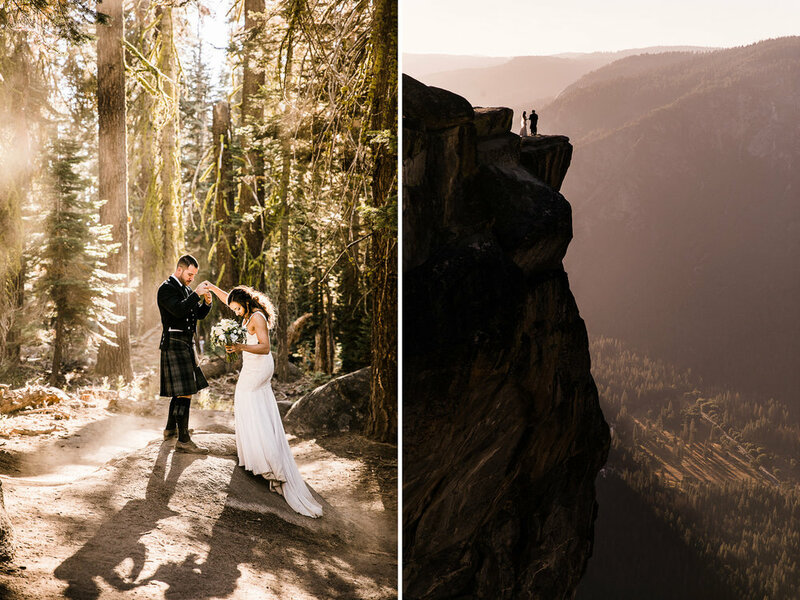 We'd talked so much about where to shoot in the Valley before their ceremony up at Taft Point, her dress with a crazy beautiful 7 and a half foot veil, his traditional Kilt to honor her Scottish heritage and her (surprise) boots as a homage to his days growing up on ranches in California. Ailsa put so much thought into her day and Austin had hiked in Yosemite as a child, but they also trusted what our advice so much. The planning process became such a sweet relationship that bled into the actual day of hiking, shooting, and fun having in Yosemite (or, in Callen's words, it was mega). Having the whole second half of the day with late-year November light worked perfectly for a first look in the valley before driving to Glacier Point for some epics, and then driving/hiking to Taft point for their ceremony. We took our time on the hike in, stopping to take some shots in the forest which ended up being some of my favorites - their wedding attire and the light coming through moss on the trees looking like something straight out of a fairy tale. A few fellow hikers excitedly congratulated them, one lady commenting how Ailsa's dress was getting dirty, to which we both smirked because she had hoped it would. The view from Taft Point was just as dreamy as the forest, with hazy golden light washing through the valley. We explored a bit around Taft Point, taking pictures while Aisla and Austin picked out a spot for their ceremony. This night was uncharacteristically not busy, so they were able to have their ceremony right out on the point. I was struck with how the everything was simultaneously traditional - a Scottish Wake during the ceremony, sipping whiskey at the end... and nothing under Austin's Kilt, as well as uniquely personal - the officiant pronouncing them husband and wife and hikers cheering as we snuck off to a corner for a first dance to an Otis Redding song right out on the cliffs. Everything conspired to work together, the result fitting them and the year of planning perfectly. We had a bit of light to work which ended up just being a lot of fun with our new friends. They were playful and wanted to sit out on the edge of the point. They seemed to forget everything going on around them - us, the other hikers, the fact their feet were dangling 3,000 feet above the valley, and only seemed to notice each other as they leaned back against the rock, laughing and kissing in a perfectly candid moment - one of my favorites all year. Ailsa and Austin brought so much to our lives this day, from the first email to our headlamp lit hike back to our cars, they were a reminder as to why this is all worth it. All the smiles and laughs, memories I'll cherish forever, adventurous times with Callen filled with second level fun as we sufferfest through long drives, cold weather, and some hard days. It was nice how this elopement brought with it the perfect couple to remind us of all this and to close to both our time in Yosemite as well as our last elopement for the year. On a related personal note, this last week my family and a few close friends joined up in Moab for Thanksgiving. We climbed together before heading back to our Airbnb for hanging out and dinner. We went around the table and shared what we were thankful for; everything put into a new light after all that 2018 has brought. There were laughs and tears and jokes only your family gets. I got to spend a lot of my time with my dad, showing him this place I love, staring out at mountains with him, hugging him, driving around this red desert which has become home the past couple years. It's a struggle to put into words, what all this - family and couples and my job and life - means to me but I gotta say, I'm so so thankful it's mine.